New Orleans quarterback Drew Brees was, as anticipated, named the Madden NFL 11 cover athlete today, appearing over a montage that honors the team and home city as well as the player. The Saints' triumph in Super Bowl XLIV was, like it or not, a national feel-good story considering the city's history in the aftermath of Hurricane Katrina. Brees is a record-setting performer who helmed their title run, has a compelling personal story in his return from a devastating arm injury, and is well known for his contributions to the New Orleans community. I really can't think of a cover subject more relevant to and well liked by football fans at the time of his Madden appearance. Michael Vick was extremely hot, a quarterback of the future, when EA Sports landed him for Madden NFL 2004. His selection might be diminished in retrospect by his conviction and federal prison sentence for running a dogfighting ring. Brett Favre had retired as one of the most beloved players in NFL history when Madden NFL 08 picked him for the cover; he proceeded to piss away much of that goodwill in a wearisome retirement drama that continues to this day. 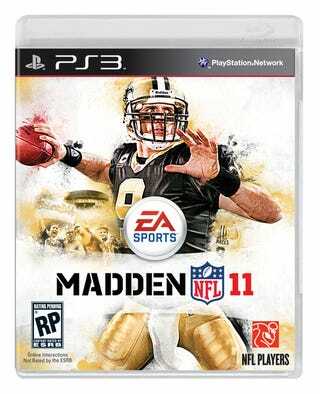 The cover art is also a departure in its inclusion of the background visuals - of the New Orleans Superdome, Saints fans, and another shot of Brees himself. Previous Madden covers were all of a single player shot. It doesn't appear to be unique to this case, as NCAA Football 11's box shot of Tim Tebow also features background scenes, and a logo change as well. Brees' selection was the culmination of two months of fan voting conducted by Doritos; he beat out Indianapolis receiver Reggie Wayne and Minnesota defensive lineman Jared Allen. A news release accompanying the box shot told fans they still had until Monday to vote on the matchup they'll get in the Madden demo. But the official Madden site says voting has closed, and the game will feature the Indianapolis Colts and New York Jets in a rematch of last year's AFC Title game.